INDIANAPOLIS (December 3, 2013) — Klipsch Group, Inc. (KGI), owner of the Klipsch audio brand, today announces the launch of a serial number verification portal now available at Klipsch.com. 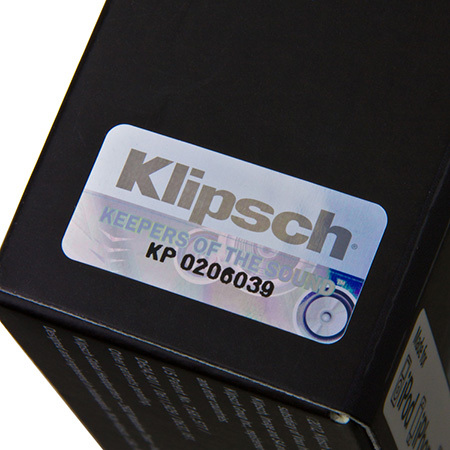 In a previous move to hinder counterfeiting, the company incorporated a serialized holographic label with targeted security features on all Klipsch headphone boxes. Now, by entering the hologram’s serial number found on each Klipsch headphone box, consumers can conclusively determine if their Klipsch headphones are genuine products. The newly introduced portal is yet another initiative the company is taking to fight product counterfeiting. Since 2012, KGI has taken action against more than 100 individuals and companies selling counterfeit headphones through online marketplaces, trade boards and e-commerce websites. To date, KGI has been awarded $60 million in judgments. Like many companies that have invested significant time and resources to develop brand recognition, Klipsch brand products are being unlawfully imitated at inferior quality and sold through unauthorized channels—often at drastically reduced prices. While not always easy to detect, the knockoff products are in no way produced by or for KGI. As a result, these products do not meet the company’s high-quality standards and are not covered by its warranty. To ensure consumers are purchasing genuine products covered by the relevant warranty, consumers are urged to purchase only through authorized KGI retailers. Constant monitoring and cooperation with marketplaces, such as Taobao, Amazon and EBay sites worldwide, resulting in counterfeit sellers being removed.